Buying a new GRP or wooden boat. This will certainly be the most expensive. In this case you need to see our list of Licenced GRP hull and wooden kit manufacturers and complete boat package suppliers. Note that new GRP boats (Winders in particular) do seem to hold their value well. Buy secondhand. Probably representing the best value for money. About 70,600 Mirror have been built, the majority in the UK and the majority made of wood. 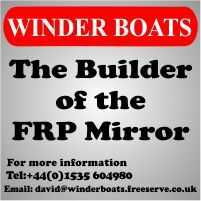 GRP boats from Trident-UK and Winder Boats are available. There are some older GRP boats moulded by Bell Woodworking/Ferranti, and this are, in my view, best avoided if you want to race. As a general principal, try and buy a boat with all the gear and extras you are going to need. Boats can be upgraded (i.e. changing to Bermuda rig, adding a spinnaker, buying a road trailer), but new items are expensive and in the long run it's often cheaper to pay a bit more, or look for a little longer and get a boat that does not need the upgrade. We have a list of boats for sale on this website. Other places to look are on Apollo Duck, E-Bay or the notice board of clubs with Mirrors. 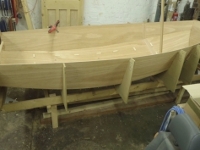 Buy a kit and building your own boat. Not necessarly that cheap compared to buying secondhand. Apart from the hull kit you will need to buy a mast, boom, spinnaker pole, sails, trolley, trailer cover and fittings. In the UK we are lucky to have two Licenced wooden kit manufacturers in our list. If you are thinking about getting a wooden boat, you need to think about maintenance and how you are going to look after it. Every boat (even GRP) needs some maintenance to keep it in tip top condition, washing down with fresh water, washing ropes, repairing sails, lubricating moving parts like blocks and cleats. But with a wooden boat it's going to need touching up at least and re-varnishing and re-painting from time to time.